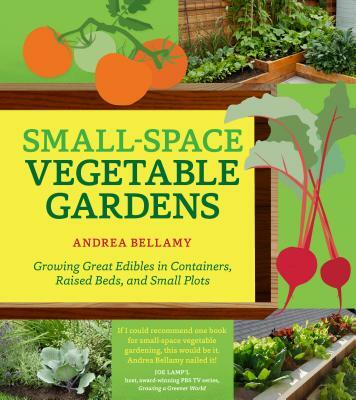 Small-Space Vegetable Gardens explains the basics of growing a bounty of edibles in a minimal amount of space. Andrea Bellamy shares all the knowledge she’s gained from years of gardening small. You’ll learn how to find and assess a space, how to plan and build a garden, and how to sow, grow, and harvest the 60 best edible plants. This hardworking and enthusiastic guide will help you take advantage of the space you have—whether it’s a balcony, a patio, a plot in a community garden, or even a small yard—to create the food garden of your dreams. Andrea Bellamy is the creator of Heavy Petal, a blog devoted to urban organic gardening. She has a certificate in garden design from the University of British Columbia and studied permaculture methods for food production at an urban microfarm. She has been gardening since childhood and has grown food on rooftops, balconies, boulevards, and patios, and in community garden beds, window boxes, traffic circles, frontyards, and backyards. She is the Grow Food columnist for Edible Vancouver magazine, and her writing has appeared in a number of online and print publications. She lives in Vancouver, Canada, with her husband and daughter.